I was perusing my flashpoint achievements today - noting once again that despite of my love for the format I'm far off ever reaching 100% completion in the category - when I noticed that in the more than three years that it's been in the game, I've apparently never done Korriban Incursion on hard mode on any Imperial character... according to my achievement panel anyway. I'm still not sure I quite believe it - I mean, yes, I play less on Empire side than on Republic, but... three years! Fate has a funny way of going about these things, so I actually happened to be queueing for a random master mode on my Sorcerer as I was confronted with this information, and guess what I got? It was actually a somewhat odd experience. The first boss kept putting dots on everyone, which I could not remember from the Republic version at all. 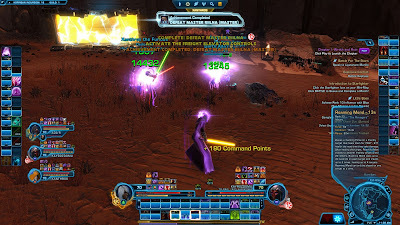 And the bonus boss was a total pushover, where I remember the Republic version being quite a pain in the rear (at least in his original iteration) due to his mass Force choke ability. The Imperial version seemed to do nothing of the sort! However, the biggest surprise to me was the second boss turning into an utter wipe-fest. Again, I don't recall ever having any issues with this on Pub side. I was starting to seriously question myself and my knowledge of the game: Is the flashpoint tuned that differently for the two factions? Was I just failing at healing? For how long are you supposed to be able to deal with that soft enrage? Our first tank left after a few wipes, citing that he had just struggled through this flashpoint recently, taking several hours to complete it and that he was feeling unable to cope with all these wipes again. When one of the dps left as well, I got worried that the group might be falling apart, but fortunately the remaining damage dealer was a friendly Assassin who seemed quite keen on getting things done no matter what and patiently waited for replacements with me. Luckily for us, our replacement tank was both overgeared and very patient, repeatedly telling us after yet another wipe that she believed in us and even going so far as to hand out free stims to everyone in the group. It sure felt good when we finally did get the boss down. The rest after that was easy again, though we learned that our friendly Assassin was even more clueless than he had seemed at first and didn't even know that he had a crowd control ability. Ever since this first came out, the Imperial Bonus Boss has had significantly less HP than his Republic equivalent. Nobody knows exactly why this is and as far as I'm aware it's never been addressed or even mentioned by BioWare.